A boat full of migrants that launched from Libya and was headed to Italy has sunk. Authorities fear about 200 people are dead. 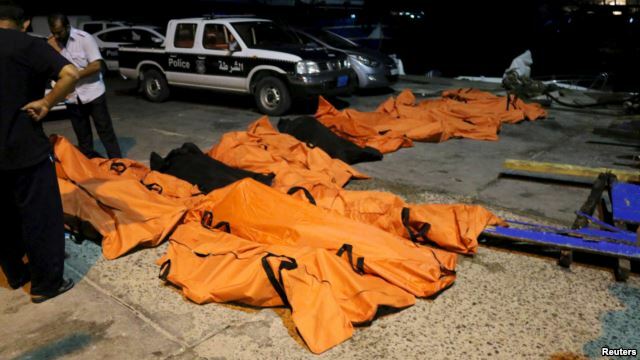 Officials say Libya's coast guard rescued another 200 from the doomed vessel off the shores of the Libyan city of Zuwara by late Thursday. Security officials said most of the migrants aboard the ship were from sub-Saharan Africa, Pakistan, Syria, Morocco and Bangladesh. One migrant told Reuters news agency the boat was in bad condition. He said the route from Libya used to be called the "route of death," but now it is known as "the grave of the Mediterranean Sea." Authorities say at least 2,400 people have died trying to reach Europe by boat this year, a toll higher than this time last year. The depredations of the Islamic State group in Syria and Iraq against monuments, archaeological treasures and thousands of innocent people have drawn outrage from around the world. No group has suffered more than the religious minority known as Yazidis, thousands of whom continue to live in U.N. refugee camps as Kurdish forces fight jihadists in northern Iraq. An American graduate student at the University of Chicago who spent time with Yazidis has become a champion of their cause. In a Skype interview, Mathew Barber spoke of how Yazidis felt betrayed when IS invaded Sinjar, in Iraqi Kurdistan, last year. Barber said widespread prejudice against Yazidis has not stopped many Kurdish Muslims from displaying goodwill. Kurdistan’s government has pledged to avenge the Yazidis and has deployed troops to drive IS out of occupied areas. Yazidi immigrants in the United States and elsewhere are trying to build communities and preserve traditions, but Barber said they leave important things behind. “The Yazidis have traditional holy places and shrines, and if they leave the region and migrate out of Iraq, it does irreparable damage to their tradition,” he said. Immigrant Yazidis in Houston and elsewhere say they are doing what they can to preserve their traditions, but their main concern now is preserving the lives of people back in their homeland.